Not much about finance or banking today. I just wanted to come back to a few concepts I mentioned in earlier posts (like here, here and here), such as regulatory regime uncertainty. We keep hearing economists, journalists and politicians complaining about companies not investing ‘enough’ at the moment. Keynesians like Krugman, de Long and co, and some other non-Keynesian mainstream economists think that the main underlying reason to this phenomenon is lack of demand. I argued several times that, while demand fell probably too low in 2009, one of the other main culprits since then had been regime uncertainty: regulations keep changing and red tape expanding, leading most firms to postpone their various investments and projects until they have a clearer view of the rules going forward. 44% of SME owners ranked economic uncertainty as their number 1 worry (with over-regulation at number 3, or 39%, and high taxes number 4, or 37%). To be fair, economic uncertainty also comprises demand uncertainty. But read the rest first. Only 24% indicated that they thought that business climate for SME had improved over the last couple of years. 42% of SME owners ranked the US growing deficit and debt as number 2 worry. Right. It’s kind of a proof, isn’t it? This is also applicable to banks: giving God-like powers to regulators (or anyone) is usually not a good idea. Uncertainty is everywhere in the banking world. Just look at the latest Swiss news: a top official announced that, perhaps, Swiss banks will be subject to a very high 10% leverage ratio. Or perhaps just 6%. Or in between. Or possibly not at all. Or…well, they’re gonna discuss and let you know later. How can any bank plan for the future and lend in such conditions? On a side not, I am wondering whether or not increasing red tape is linked to The Decline of Creative Destruction, as this Bryan Caplan piece was named today. Surely it is. Very interesting chart anyway (see below). 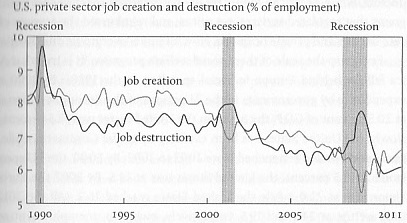 Job destructions during the crisis were actually at the same level as they were throughout the 1990’s… It would be interesting to compare this chart to the evolution of business red tape. Unfortunately, this isn’t my area, so I’ll let you do it!